ATHENS, Ga. 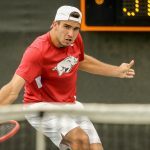 The University of Arkansas men’s tennis team fell to No. 19 Georgia, 6-1, in Athens Sunday afternoon. The team will return to action this Thursday at Alabama, before returning home to host Auburn on Saturday. 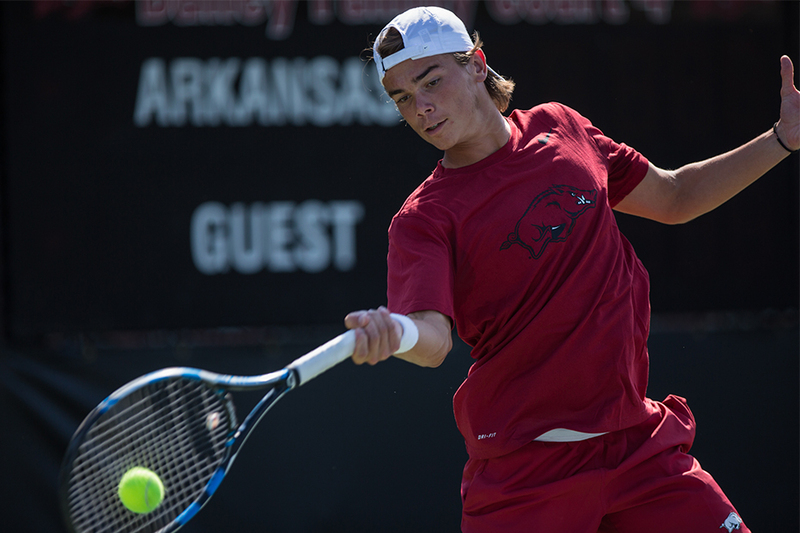 The Razorbacks got out to a 1-0 lead by taking the doubles point on courts two and three. Alex Reco and his partner Jose Dominguez Alonso took their court 6-4. After falling on court one, the point was decided on the second court as Maxim Verboven and Enrique Paya delivered a 6-4 victory to secure an early lead. The Bulldogs would even the match on court three, and take their first lead on the second court as No. 26 Emil Reinberg (UGA) def. Adam Sanjurjo 6-3, 6-1. The match would be clinched on consecutive two-set victories by Georgia on courts six and five, respectively. Oscar Mesquida would take his match to the third set tiebreaker, before falling to 15th-ranked Jan Zielinski (UGA), 3-6, 6-3, 6-4.